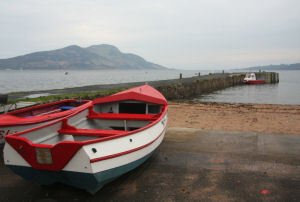 Lamlash, on the Isle of Arran, is a town built in Edwardian style in a boulder-strewn bay. Boat trips operate to Holy Island off the eastern coast from here. Lamlash Bay served as an important naval anchorage during the first world war, and relics of that time are still visible.